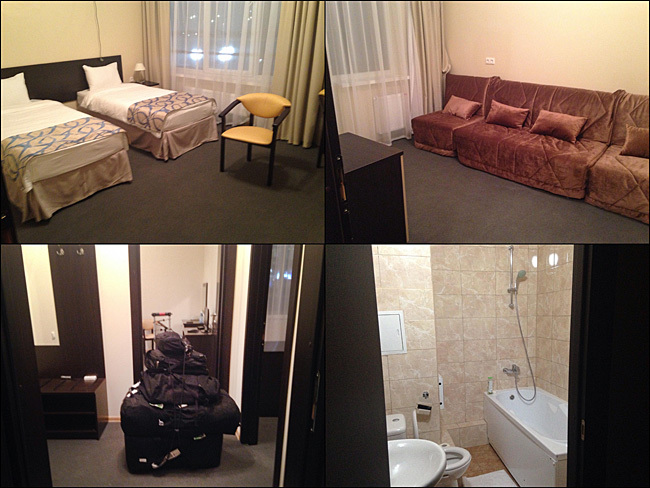 Robert Hanashiro's room at the Chistye Prudy media housing complex. Whoever said, "Getting there is half the fun" never had to sit in an aging Aeroflot AirBus 330 for 13 hours. The only saving grace to my bunched up knees and aching back was sitting next to my good friend Shawn Cullen who is working the Sochi Winter Olympics for Sports Illustrated. But boarding near the final group, I was faced with the photographer’s dilemma: No space in the overhead bin. Shawn had held some space for me, but I could only get my Think Tank Photo ChangeUp fanny pack and North Face parka into the space. The TTP ShapeShifter went under the seat (something I’ve done dozens of times). We had made a sort of pact: Stay awake for the entire trip to Sochi so upon our arrival at 9PM local time, we could try to get the body clock started in the right track. But Shawn gave in and dozed off for a couple of hours. It’s funny I saw this remake of "Star Trek Wrath Of Kahn" when it hit the theaters and when I watched it on this flight- I didn’t remember any of it. I don’t care what anyone else says, Ricardo Montalbán is a helluva lot better Kahn and the Brit (sorry Emma). The first three episodes of "Modern Family"
Never watched "Modern Family" until it hit the USA Network and now I'm a big fan. I hope when I turn 65 I'm as cool as "Jay" (Ed O’Neill”) or as rich. The current remake of "Robo" has been pretty much panned so I really wanted a reminder of the good things about the original. Peter Weller is great as Alex Murphy, the RoboCop and I was always a big fan of Nancy Allen – ever see the remake of "Dressed To Kill" and you’ll know why. "RoboCop II" - they should have left well enough alone, like the remake in the theaters now. Arriving at Moscow Sheremetyevo International Airport we got an unexpected, happy surprise: Several of our USA TODAY colleagues that were suppose to depart from NYC before us were booked on our flight after weather made them miss their original connection. On any lengthy trip, especially one with a connection (Moscow), you wonder throughout the flight "Will my bags make it?" As I wrote previously, you plan, you pack, repack and repack --- the mission being: 1) making weight (50-pounds) and 2) it gets to there. 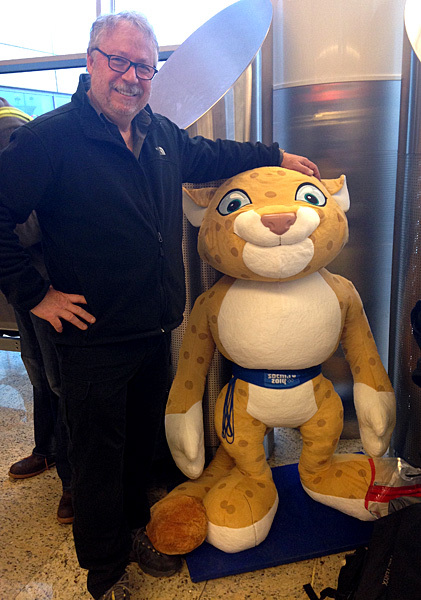 When we arrived at the Sochi Airport - fuzzy from hours on planes and airports - we were pleasantly surprised that all of our checked bags and cases (probably 16-18 total) were all accounted for by our boss Andy Scott! Mission accomplished! When you’re covering an Olympics, you spend more time on a shuttle bus than you do in a venue - at least it seems that way. The bus ride from the airport to our home-away-home the "Chistye Prudy" media housing (known to us before getting there as Omega 12) was the easiest part of checking in. After nearly 16 hours in the air and in airports plus a 12-hour time shift, all you want to do is sleep and soon. As widely reported, Olympic housing had its share of snafus and ours was a 2 hour wait for rooms to be readied- at 11:30PM. After being introduced to the cafeteria and hanging around for about 90-minutes who should come literally stumbling in but Shawn! Since leaving the airport on a media shuttle he had been on an hours-long Russia version of "Mr. Toad’s Wilde Ride" dropped off at a couple of wrong housing complexes and then literally walking the streets in search of "Omega 12." Oppps. It’s known as "Chistye Prudy" by the locals and especially the bus drivers! A couple of things we learned right away about the accommodations - besides all of the whining by sports writer/bloggers already in-country we read about- door locks are a nebulous concept, especially when it comes to keys. Who needs a key when someone can get you into your room with a screwdriver and hammer? Another concept lacking are ramps - on sidewalks and into buildings. Getting carts of gear to our apartments- Bob had 7 pieces on a four-wheeler and I had 5 on the Kart-A-Bag- where challenging to say the least. But I guess it was a very small price to pay to finally get into a warm, clean room, with hot running water and a shower.